The boys were gone for the weekend so Sophie and I got some sewing done. I loathe making large quilts…but I forged through and got it done while I had the time. It’s a Queen size at 88″ x 96″, and since I don’t really use quilts on our bed it’s the perfect size to fold and lay across our King bed for looks. I’m glad to see this one done and ready to send to the quilter….now I remember why I don’t make many big bed quilts! Sophie is so cute! And the quilt too of course! Your little Sophie is adorable and I do love your quilt! Beautiful quilt…love the soft colours. And beautiful baby Sophie too! Those little chairs are so handy! This brought back many memories of my kids sitting in those at that age. Do they call them Bumbos in the states or is that just the UK. Cute quilt! I can't wait for that line to come out – that little white sprig print is really calling to me! And I'm kind of the opposite when it comes to quilts. I've made a few smaller ones but mostly make either king or queen size. They tend to get awfully boring part way through, but I just know I'll use them more. Beautiful baby, beautiful quilt! Love it, looking forward to the tutorial! Cute! 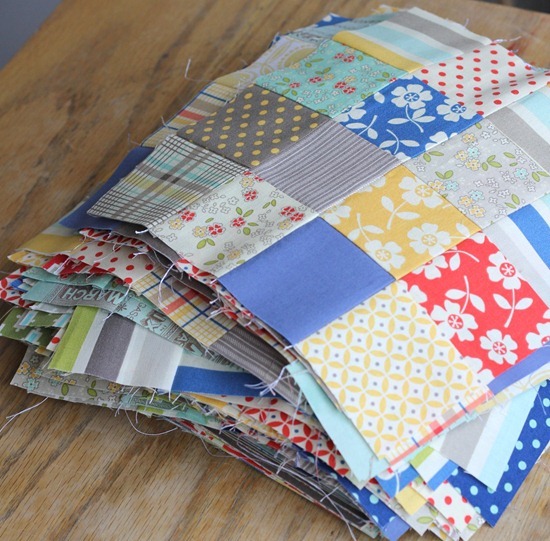 I have never made a large quilt… ever! Mostly because I'm cheao and they require more fabric, hee hee! What a lovely quilt…so soft and summery. And isn't Sophie the cutest in her Bumbo chair — I remember those! Lovely, not quite sure why it has that name. When you do a tutorial on it, please explain name too. The color scheme on this one is lovely. It reminds of some pattern paper I used to have. I know how you feel about large quilts, I'm perfectly happy sewing lap quilts, wall hangings, single bed quilts but as soon as I try a large quilt I procrastinate, anything but sew the quilt. Your baby is precious! love the quilt too. Ahhh…you have your own personal quilt police about…love it! 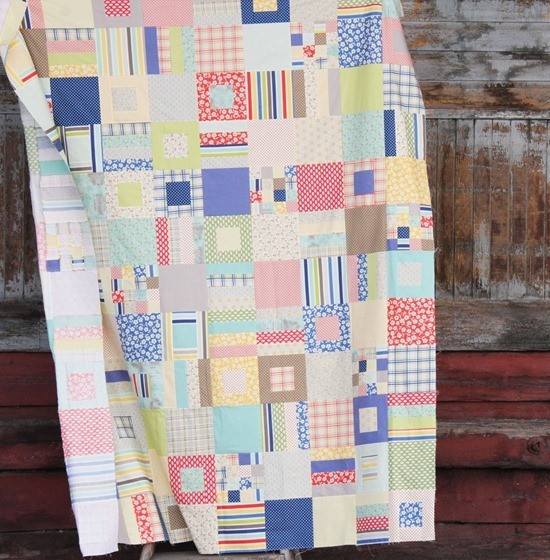 Can't wait to see this quilt in "real life" – it's adorable. But not as adorable as little Miss Sophie – what a BIG helper! Aww! Baby in the bumbo seat while you quilt!!!??? Priceless! I hope to be able to take a similar picture in a month or two. Love the quilt! Oh, I love the quilt and your choice of fabrics. I made your sprocket pillows for my daughter's birthday from the tutorial posted at the 36th Avenue and they were a real hit! Your instructions were easy to follow and no measuring! Thanks for sharing. Do you have the pattern for sale? Wow. The quilting is growing . . . and the baby is growing! Great photo. I would not be able to work on anything with such a babe of a child on the desk! You just keep holding her! The quilt is gorgeous too, by the way! Sophie is just too cute. And she's sitting in the bumble seat – I know this because my granddaughter has one. Oh almost forgot your quilt top is cute too. Sophie is just too cute!! :) They didn't have those seats when my daughter was little- what a godsend it must be- so cute! Love the quilt and can't wait for the tutorial! Sophie's toes look munchable…awwwww..she is adorable, Allison. I am sitting next to my stash until you tell me the yardage on the tutorial….can't wait to start "pulling" those fabrics! Love it! I just ordered some of this to make a baby quilt for our new little one in October and some pillowcases for our bed to match! Love your little seam analyzer, Sophie! She is so cute watching you sew. The quilt looks great and I definitely feel your pain on large quilts. Love it. I've yet to brave anything beyond a small wall quilt. Beautiful! Love the fabrics and the mixture of blocks too – very summery and beachy – gorgeous! What a doll she is! And such a wonderful quilt. I love this line. 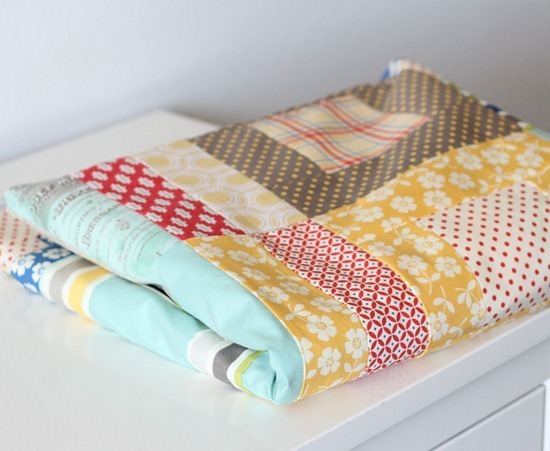 With the tutorial I'll know what to buy to make this quilt. It's so cheery to me. Thank you, thank you. This quilt is super pretty. I look forward to the tutorial! Love the look! Cannot wait to check out the tutorial. Just be glad you don't have to quilt it yourself, too ;) Its really pretty – I love the fabrics!! 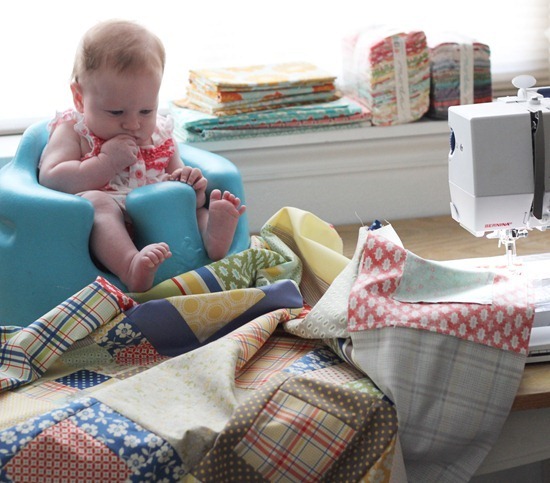 What a cutie…and love the quilt! love the fabrics, good work! Hello! I am a fairly new reader and really hoping to teach myself to quilt! :) Not sure if that is doable but I thought about trying this tutorial. Do you think this would be a good one to learn on? Also, once the top is done would I have to send it to a quilter or can I just put on the batting and the back side of the quilt? Thanks!! I wish I had a little chair for my children when they were little. I would sew with babies on my lap at times because I wanted to sew so bad. I love the bigger quilts, but they really are a lot more work and awkward to move around on the sewing machine.